5313 New Cut Rd, Louisville, KY 40214 is a three bedroom 1 1/2 bath stone ranch located in the Orchard Hill neighborhood just across the street from Iroquois Park. The property has fabulous potential as an investment property and is also move in ready for owner occupancy. The Living Room is spacious with a pleasant fireplace & hardwood flooring and opens to the Dining Room. The Kitchen includes a double sink and access to the Breezeway. All three Bedrooms have hardwood flooring and are convenient to both the Full Bath & Half Bath. The Breezeway located between the home and the garage houses the Laundry area. The property also has a 2 car attached garage. 5313 New Cut Rd, Louisville, KY 40214 has a great back yard with a relaxing patio & two storage sheds. Several updates made by the current owner include the motor in the furnace, pvc piping under the home, and the electrical panel in the garage. Call 502-371-1173 today for more information about this home for sale in Louisville. 3311 Leith Ln 6, Louisville, KY 40218 is a beautiful two bed one and a half bath condo in Chateau Square. The unit is FHA approved and offers new carpeting. There is fresh paint in the Master Bedroom & Full Bath. The Living Room opens to the Dining Room and features a decorative only fireplace, elevated ceiling, & neutral walls. The Kitchen is pleasant with plenty of cabinet & counter space and access to the back deck. The Master Bedroom includes another exit to the back deck and is atached to the half bath. There is also a second bedroom and Full Bath. 3311 Leith Ln 6, Louisville, KY 40218 showcases a huge 10' X 16' deck for outdoor dining and entertaining. The unit comes with designated parking space 3311-6 in the covered rear parking lot. The parking area includes security cameras and is well lit. Residents ot Chateau Square have access to a shared Laundry Facility. Call 502-371-1173 today for more information about this Condo For Sale in Louisville, KY.
222 E Witherspoon St 1102, Louisville, KY 40202 is an exquisite two Bed two Full Bath 11th story unit in Louisville’s prestigious Waterfront Park Place. 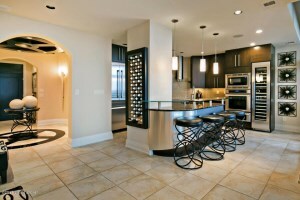 This property offers quintessential luxury urban living with impeccable design and custom finishes throughout. Enter into the contemporary Foyer with inlaid tile design, elevated circular coffered ceiling, & arched entryway to the Great Room. Relax on the balcony with your morning coffee or observe the evening sunset over the riverfront & Slugger Field. This is the perfect home to host events such as Thunder Over Louisville parties. The spectacular Great Room with tray ceiling & floating entertainment center showcases an impressive wall of windows with panoramic views of the city skyline. The Great Room is open to the Dining Area. The Gourmet Eat-In Kitchen includes top of the line stainless appliances, wine cooler, double ovens, built-in coffee maker, induction cooktop, & breakfast bar. 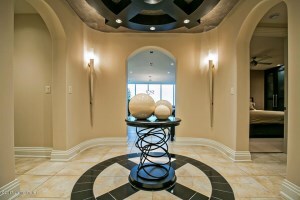 The Hallway which leads to the lavish Master Bedroom boasts an artistic waterfall feature. The Spa like Master Bath displays dual vanities, jetted tub with lighting, oversized walk in tiled shower with 5 shower heads, & separate water closet. The second Bedroom has its own private Full Bath with double vanity, tiled steam shower with four shower heads, and includes a rainfall shower head on the ceiling. Private executive office includes sleek built-in desk & cabinetry. 222 E Witherspoon St 1102, Louisville, KY 40202 has a convenient laundry area in unit, round bullnose drywall corners, remote control blinds, Speaker Craft surround sound, & Sonos wireless system. New owners can enjoy an afternoon swim with guests at the rooftop pool with stunning views of the riverfront area & Yum Center. Other building amenities include elevator, fitness room, yoga room, club room, and terrace room with balcony and catering available for private parties.The secured building with 24 hour attended lobby is an added bonus. This property also includes 2 spots in the parking garage. Call 502-371-1173 for more information about this gorgeous home for sale in Louisville, KY!.